The Van Martins believe the purpose of their mission is to share their music and talents with other churches for the purpose of spreading God’s message. In discussing goals and intent, The Van Martins believe that they have been called into this ministry and desire to remain in His will, serving others in song and testimony. They believe there is currently a real need for this service and helps fulfill the spiritual needs of their own families at the same time. The Van Martins are made up of a group of believers brought together by the transforming grace of Jesus Christ. With backgrounds in the Anderson Church of God and Church of the Nazarene, the Van Martins share the abiding love of God by caring for one another, and reaching into their neighborhoods, their region and the world with the Good News of salvation. Led for many years as a worship and praise team by Ron Van Volkenburgh, the Van Martins are musical evangelists that bring God`s word to people in every situation, from all walks of life, helping them to grow in love and service to our Creator and Lord. Colossians 3:16-17 says 16 Let the message of Christ dwell among you richly as you teach and admonish one another with all wisdom through psalms, hymns, and songs from the Spirit, singing to God with gratitude in your hearts. 17 And whatever you do, whether in word or deed, do it all in the name of the Lord Jesus, giving thanks to God the Father through him. 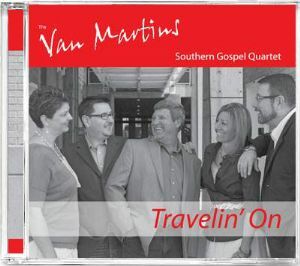 The Van Martins are guided by this seemingly simple command; share their lives through the gift of music from the Spirit, with gratefulness of heart, in His name.